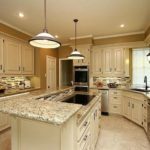 Golden Ivory: The combination of Giallo Ornamental granite is yellow-beige color with a bit of specks of black and gray. 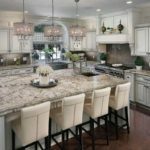 For backsplash ideas, the color like gray or light brown goes very well with the texture of the materials without disturbing the granite’s beauty. As long as you find something that has some red and natural earth colors to highlight the different colors in the stone. 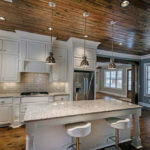 Backsplash can add tons of character to any kitchen. 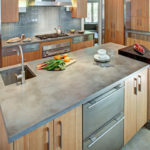 That’s why it is important to chose what is good with your countertop. For flooring ideas, you can use the contrast here according to your taste. 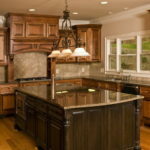 Because of dark cabinets need lighter floor tiles and light cabinets need dark hardwood flooring. This stone comes three different shade of colors. The first one is regular tones which is peachy and dark spots. Second, Giallo Ornamental light which is lighter version with original pattern. This one saturated with mostly cream tones. Third one is pink ornamental color. Moreover, they are all from the same quarry. 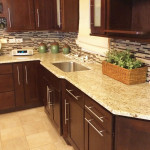 If you use this granite in a small kitchens will be up the joyful environment. Moreover, for more complicated jobs you would want wall colors to be beige tones and almost similar colors for the floors. 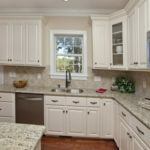 For cabinet ideas, it is also more popular white and white tone cabinet colors rather then dark ones. Part of the this year trend, there are lots of ways to mix it up. Colors such as Giallo Ornamental tones will remain mostly neutral. But interesting concept comes in many other designs. 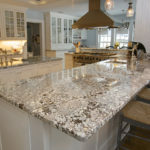 Furthermore, the cost for Giallo Ornamental granite countertop is $45 per square foot for 3cm residential installations. Inspiration for a traditional kitchen in with Giallo Ornamental granite and subway tiles combination. 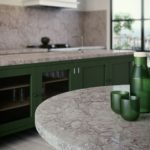 In order to create beautiful cozy small kitchen brighten up java green maple cabinets combined by Giallo Ornamental granite countertops. 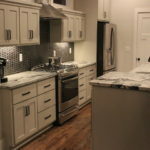 It furnished with white subway tiles with almost same color grout like cabinet colors. Light oak color hardwood floor brought the kitchen to another dimension. Porcelain apron front farm sink also combined with the rest of the painting and windows frames. 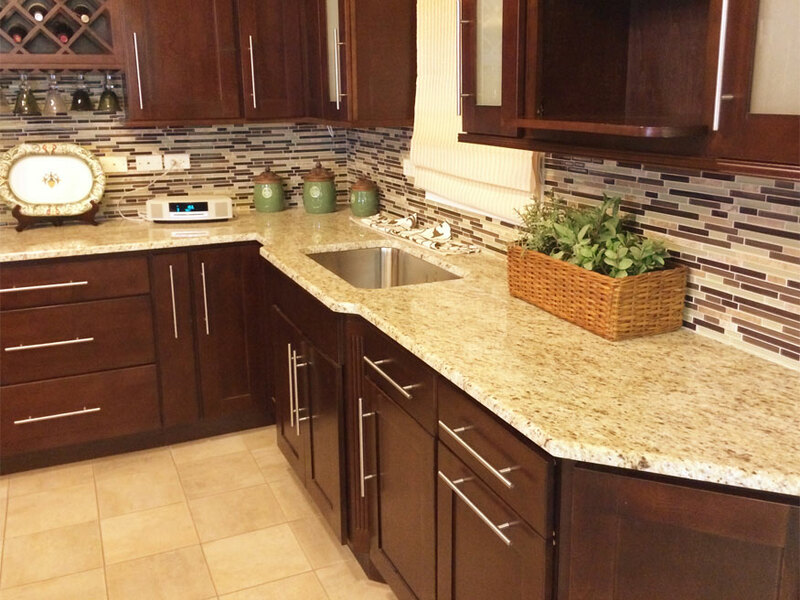 Stunning kitchen lay out with Giallo Ornamental granite countertops and beautiful dark cherry cabinet. 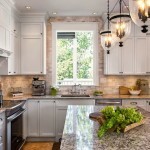 Beautiful tumbled travertine backsplash along with stainless steel appliances made a good match. Original floor tiles remained to complete the design for kitchen remodeling. 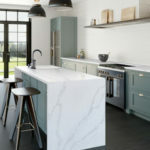 Not only this but also love the contrast with darker cabinets. Furthermore, all of the darker cabinetry the backsplash wall covered with beige tumbled travertine tiles. The main concept here to make the kitchen are brighten since there is no natural lights coming. On the other hand, they selected to accommodate the rest of the kitchen which is light blue. Beautiful bright kitchen with a lots of windows and open floor plan. 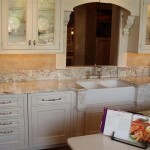 In fact, perfect dark cabinets and light countertop combinations featured with Giallo Ornamental granite. 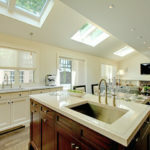 Center island which has a cook top and hood from the ceiling along with travertine backsplash. 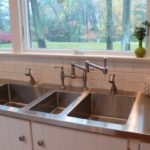 Stainless steel apron farm sink with natural travertine floor tiles go well with yellow-beige wall paint. Therefore, Giallo Ornamental shows itself with darker cabinets versus the light ones. The reason behind is that those brown/burgundy dots catch the darker cabinets and main light bedrock is defined for the contrast. 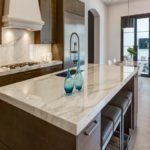 This combination is particularly warm and inviting when used with under cabinet lighting that reflects off the polished granite surfaces. 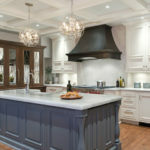 Traditional kitchen with dark and light cabinets combinations. 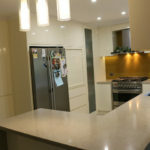 Giallo Ornamental granite countertops fitted perfectly. Center island with a raised bar top has bar sink. 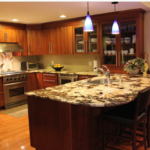 Kitchen perimeter and wall cabinets are dark featured stainless steel apron farm sink and stainless steel appliances. Floor is dark hardwood floor made a good combination along with wall paint. If you use with two different cabinet colors still with only one color top. Like this example, darker main kitchen and rustic green island are perfectly matched with Giallo Ornamental granite countertop. Unless using dark cabinets and light floors combined to make soft more sophisticated look. Giallo Ornamental granite has to catch this combinations. 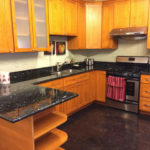 Using main color as you in this kitchen example dominated by two colors. One of them is dark brown almost black cabinets, and the other is cream-beige mix everything else in the room. 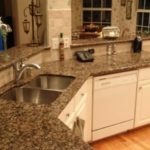 As a result, this is a perfect color combinations for Giallo Ornamental granite countertop with all the other elements in the kitchen. 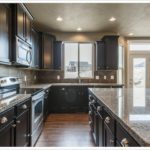 Do you know what backsplash is used with the Giallo Ornamental granite in the picture with the dark brown Shaker cabinets? The relevant picture also has a green plant in a light brown rectangular basket and three ceramic green containers. Thanks much if you can help! 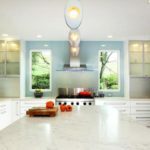 This backsplash is glass and stone mixed together. You can find at Mosaic Decor/Fairfax-VA and tell them you heard from Decor-eye. They can give you good price. I hoped this might help you.